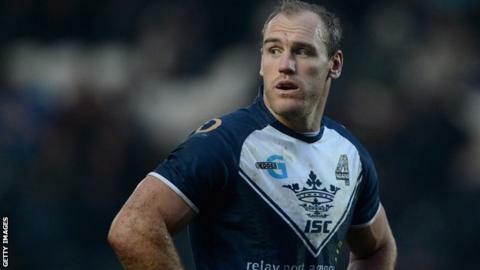 Hull FC captain Gareth Ellis believes the side are capable of ending their eight-year wait for silverware. Ellis, 31, joined the Black and Whites from NRL side Wests Tigers at the end of the 2012 season. He told BBC Radio Humberside: "It is a magnificent feeling to lift trophies and to do it here would be special. "I think we can achieve that this year. The squad we have put together now is second to none, both the first team and the younger players too." He added: "It would be great to be part of the long lasting legacy of the team that brought the glory days back to Hull." The England forward takes his side to former club Leeds Rhinos in their opening Super League fixture on Friday. Ellis played for the Rhinos for four seasons after joining from Wakefield and helped them to Grand Final success in 2007 and 2008. He believes his new side should aspire to replicate the model of the Headingley side. "I'm really excited because I had four great years and felt like I grew up as a player and a person there," he continued. "They're doing things slightly differently to when I was there but they certainly know how to win and they find a way to do it. "It's a massive organisation and to be part of it is a privilege and an honour. "It's a big game for us because they are the champions and we are the team that has been spoken about but we haven't done anything yet. The talking is over now, we have to produce on the field."